Commanders! 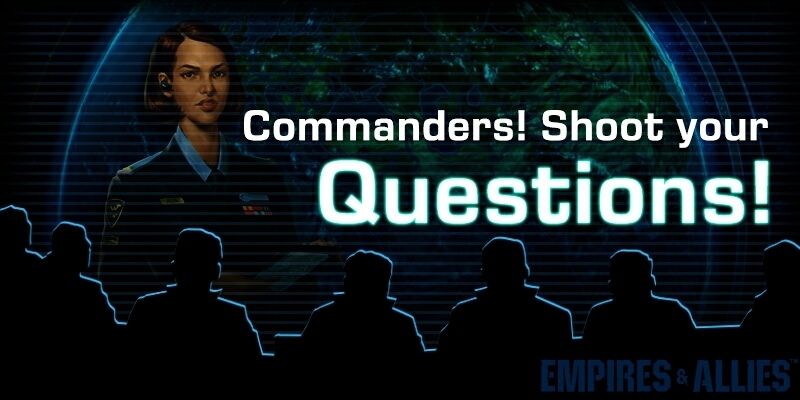 Here is your opportunity to ask team Empires And Allies the question you always wanted to ask. Comment below and shoot your questions between 10th of June, 8:00 am (PDT) to 11th of June, 7:59 am (PDT) 2018. Hurry! Commanders! Thank you for all your questions. We will be back with your answers soon, till then hold tight and keep playing Empires And Allies. Are you coming back manticore? And when will you get better rewards of technology and steel? Why upgrade defense forces, in each new update the defense forces will increase, why do not the attacking forces be added? Would like to see a longer battle time. Since the introduction of the new defences and levels it now takes longer to clear the bases. I cannot now complete hammerfall since the time is too short. Suggest the timer be increased from 3-4 mins to stand a chance.